Life is full of ups and downs, opportunities and challenges. And sometimes, we need guidance, motivation, or a helping hand along the way. This need can come at any time in our journey through life and for many reasons. So it’s important the help available to us is just as unique and individual as we are. Stepping Stones in Life Therapy is a local organisation with a genuine understanding of this need for flexible, customised therapeutic options. Founded by Barbara Kapser in her Darwin home four years ago, the organisation provides a safe and homely environment in which to seek professional assistance and services for a wide range of needs. Stepping Stones in Life Therapy became the first allied health service in Katherine when it opened its second location there in March this year. The organisation has grown to a team of 11 specialist staff providing services in Darwin, Katherine, Alice Springs, Tennant Creek and Gove and on demand throughout rural and remote areas of the Northern Territory. Services are available for children, adolescents, adults, couples and families, as well as people with special needs including autism, sensory integration disorders, Dyspraxia, developmental delays, Down Syndrome, Cerebral Palsy, Acquired Brain Injuries and visual impairment. 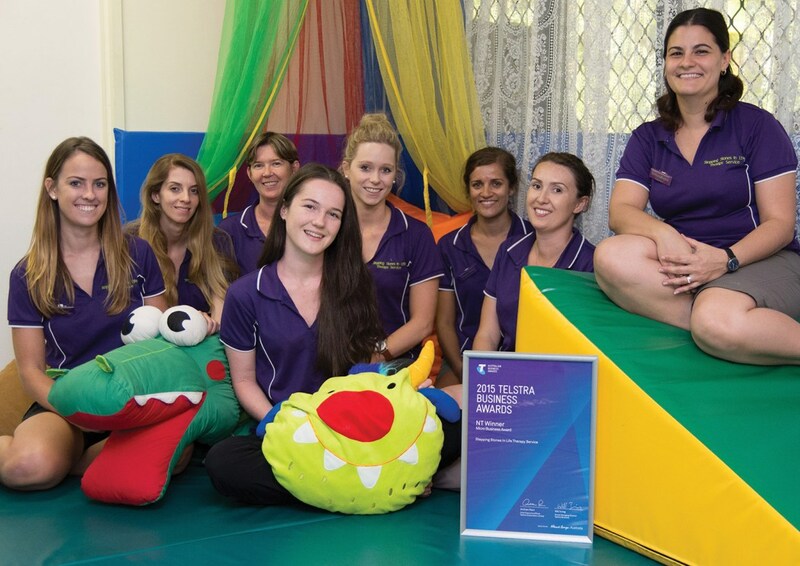 The multidisciplinary organisation consisting of Psychologists, Speech Pathologists, Occupational Therapists, Yoga Instructors, and Expressive Arts Psychotherapists provides a range of therapy options. Services include Motivational Interviewing, Acceptance and Commitment Therapy, Sensorimotor Psychotherapy, Voice Movement Therapy, Trauma Focused Therapy, Emotional Freedom Techniques, Cognitive Behaviour Therapy, Dialectical Behaviour Therapy, Art Therapy, Aquatic therapy, Circle of Security, Neurosequential Models of Therapy, Play therapy, Sensory Integration Therapy, Dance Therapy, Therapeutic Listening, Hydrotherapy, Astronaut Program, and Mini Mule Therapy. After working in the disability sector for five years, Barbara was motivated to start the organisation to address a lack of services across the Territory. She said the assistance available had been restricted to the most highly populated areas, forcing people to face considerable expense in travel and accommodation to access services. “We provide flexibility and so many therapeutic models because we don’t want to limit peoples opportunities,” she says. Stepping Stones in Life Therapy also works to reduce financial burden. It is the only allied health service in Darwin and Katherine offering bulk billing for selected therapy options, as well as onsite health cover rebates. Accepting the award for the 2015 Telstra Business Award NT Micro Business category, Barbara was overwhelmed with emotion, and gratitude for both clients and staff. “I was not expecting a nomination let alone winning, so it came as quite a surprise,” she says. Stepping Stones in Life Therapy is set to continue growing, with plans for the introduction of new therapy models and a new office in Alice Springs within the next 12 months.